The peaceful mind is distracted by a thousand beeping horns. Pain and pleasure mix in a tasteless concoction that satisfies no appetite. 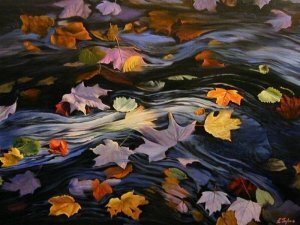 It is a stream of consciousness as thoughts go flitting by like leaves in a rushing current. I have written you several times, Michael, the first time right after the tsunami in 2011 which happened the same day you had predicted Pisces water water everywhere and then more recently, after my father died two years ago and my family and I were at odds – I’m the balsamic Cancer. This is for you, Michael, but for everyone who reads this, too – even as the world pushes out of comfort zones, we all begin to really understand the depths of gratitude and that for which we took for granted is all a gift, pain and beauty at once. Sunday night I went to bed, told my husband there was a fire burning and he replied, “do you really think they are going to let Santa Rosa burn?” so I went to sleep. In the morning, we learned the answer, yes – although “let” may be too strong a word, as it implies a choice. Santa Rosa burns. I packed up myself and the dog and headed 100 miles south to my Mom’s where I write this now, the future of my home uncertain…but it is all what it is, nothing for granted, every breath a gift. The ephemeral to be cherished.